A good long friendship is a blessing and a foundation, living, as it often does, through marriages, children, and many of the ritual humiliations, disasters and adventures that accompany a normal human life, but it is doubly blessed when the art forms of both ends of the relationship can meet in a fine collaboration. This is a marvelous representation of my essay ‘Joy’ from Consolations done by my good friend Edward Wates. It was indeed a joy to pick up and handle, when it was just finished in Edward's ‘Atelier’ in Oxford, England; the fine script and papers, making it a meditation and an invitation to spaciousness and depth. I have many of Edward’s pieces on my walls and many of his handmade books on my bookshelves but decided to forgo buying this one and let it be put out in the world to give others a chance! The first of a series, I do hope, and listening to him speak about his newly emboldened artistic process over a glass of wine, you might even be able to twist his arm for a specific commission…. ‘Joy’ by David Whyte. Original handwritten 8-pp. manuscript book, title page signed by David Whyte, calligraphy by Edward Wates in black Chinese ink with two hand-painted gouache illustrations on Zerkall paper, single section binding in millboard covered with orange Khadi paper, orange threads, black Zerkall Ingres endpapers, 14x5⅛” trimmed page size. UPDATE JULY 16th: This piece sold the first day of this posting. Please contact Edward Wates to inquire regarding an individual commission. EDWARD WATES is an English calligrapher based in Oxford, UK. He worked in academic publishing as a book designer for over 40 years. His calligraphic work has been widely exhibited and is held in public collections in the US, UK, Germany and Pakistan. He is an elected member of the Letter Exchange, an organization for professional lettering artists in the UK. 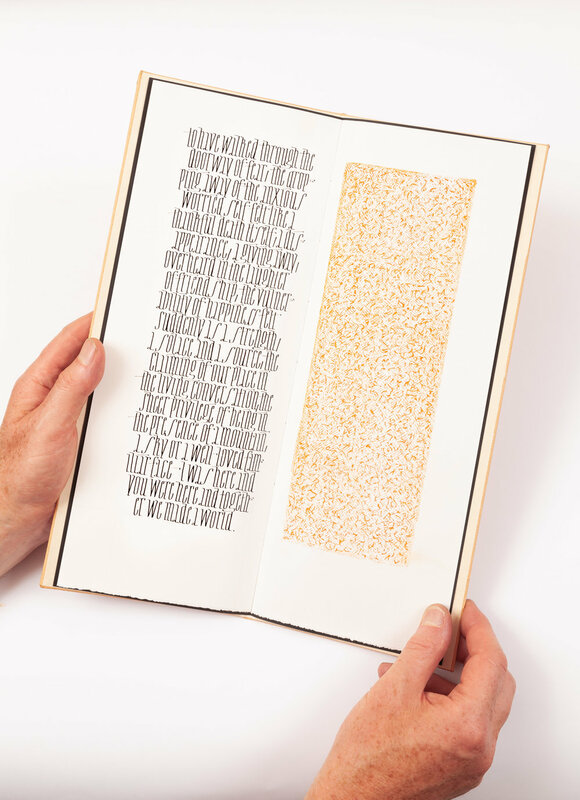 He is willing to undertake individual commissions using texts by David Whyte.